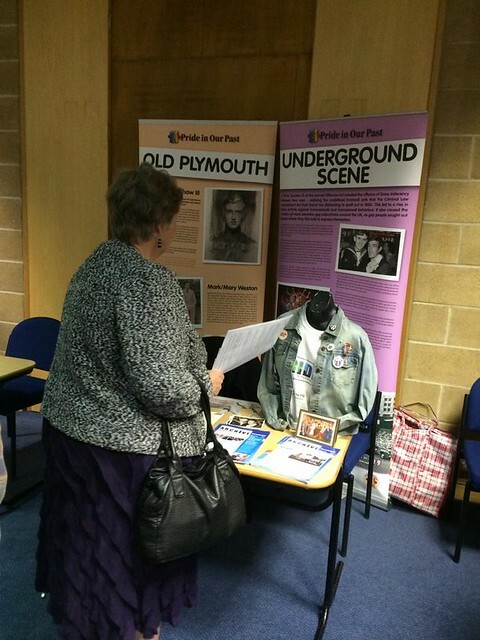 Today the Plymouth LGBT Mobile Archive was one of the exhibits at the Local Studies Day which is one of many events being held in the city as part of the Plymouth History Festival 2014. The Local Studies Day event is organised by Plymouth City Council Libraries, Museums and Record Office, in partnership with Plymouth University, Peninsula Arts and the Old Plymouth Society. The event was held in the Robbins Halls & Conference Centre (Plymouth University). No sooner as we set up a lady came along to say how important it is to see everyone’s history is represented at these events. Throughout the year we ensure that our own communities histories are represented at a cross section of events in Plymouth, the surrounding area and even at a national level. We can scale the archive display to suit the space available either indoor or outdoor. Contact us if you would like us to bring the mobile archive to your event, workplace, or school. View images of the mobile archive at various locations on our Flickr Mobile Archive album. Visit the Plymouth History Festival Website for more details about all the events that are taking place in May as part of the Plymouth History Festival.